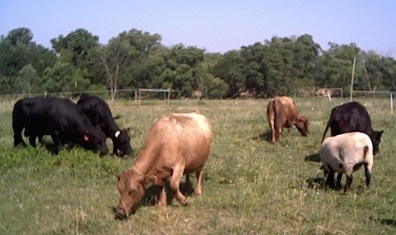 Dexter cattle are an especially interesting breed for their hardiness and history as "survivor cows" and "house cows." Their docile temperament, easy calving, foraging ability and feed efficiency, and small size make them the breed of choice for Gladhour Farm—these, along with fertility, longevity, and good conformation as dual purpose cattle are ongoing breeding goals. Current herd sires (starting with 2016 calves) are N Paradise Woodmagic (a Legacy bull), Gladhour AhPrince O'Pref, and Gladhour Auri O'Pref--the three pictured at the top of the list below. Calves born in 07 through 13 were sired by the next nine of the following bulls, so these bulls are in the background of many of my cows. For 2014 calves, I added Gladhour Wolirence. Calves of 2015 were sired by Gladhour X-Rach O'Pref, Gladhour Xipix O'Rol, or Gladhour ZePic O'Pref. 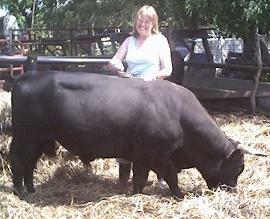 Dexters For Sale Dexter Cattle General Information Why Rare or Heritage Breeds? Why small cattle?